Beautiful room. I love that the shades match the wainscot. Where are the couches from? Thank you SO much for your response! I'm also wondering if you remember the dimensions on the carpet & the beautiful ottoman you designed? The rug was just shy of 8x10 and the coffee table was somewhere around 48x30. Ottoman/coffee table - I would love the ottoman it would go perfect with our furniture. Who makes it? its very nice! can you advise aprox cost? I don't release financials related to my clients projects but if you are in the Chicago-land area please feel free to email me and I can provide you with a quote for this item. Good luck with your projects! What color is the wall paint? The wall color is Benjamin Moore China White and the trim is Benjamin Moore Gray Mist. These are great off-whites in the sense that they develop great "color" in shadow and at different times of the day. Hope this is helpful! That was my first Internet question ever. Thank you for the prompt response!!! Interesting rug. Who makes it? - I love the rug with the grey sofa. Is there any grey in the rug? Who makes it / where can I buy it? Glad you like it! To this day it's still one of my favorite rugs I've placed with a client. The rug is a Persian Gabbeh purchased at Oscar Isberian Rugs in Chicago. It's one of a kind but if you look specifically for Gabbeh style rugs you might be able to find something similar. 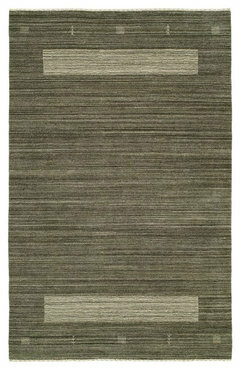 The rug has a multitude of natural colors running through it from cream to caramel-tone browns to warm grays. I hope this information is useful! What material is used for the fireplce surround? Thank you for your question. The fireplace mantle surround is painted Popler. The stone surround and hearth is matte black slate. You can view our full company profile at www.nm-interiors.com - good luck with your projects! Who makes those sofas? - They're beautiful. 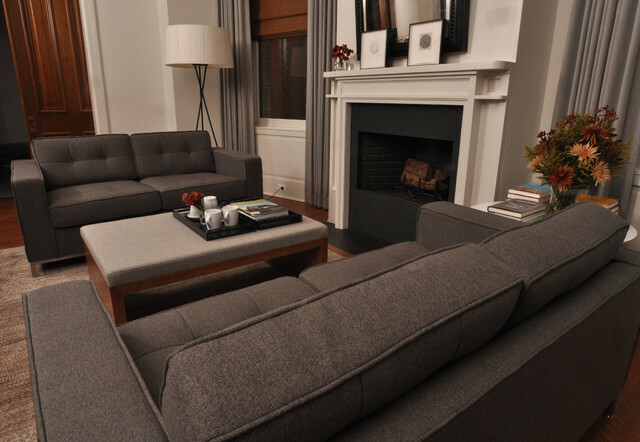 The sofas are by Gus Modern. Glad you like them! The floor lamp is by Santa & Cole. Enjoy! These curtains are perfect. - What material? And/or where are they from? Thanks so much! The drapes were custom made from a wool textile by Pollack. The wall color is Benjamin Moore China White and the trim is Benjamin Moore Gray Mist. Clean, classic, warm, inviting, similar to what I'll have layout wise. Maybe two chairs in lieu of a couch.